the title of the talk »Wake Up Smiling« – Sunday 5 October, 2pm. The event took place at the Institute of Education, University of London. … before they join the controversial group that is considered by most of its ex members to be a harmful cult. Our first information sharing outside an NKT talk – 200 leaflets! Find out how to greet each day with a smile and see new opportunities in every encounter. In this talk we will learn how to develop an open and warm heart towards others, freeing us from anxiety and self concern and bringing a freshness and joy to each day. Join in a guided meditation using the methods explained so you can start to experience the peace and freedom of a calm, clear mind. Gen-la Kelsang Dekyong is a Kadampa Buddhist nun and an inspiring teacher who teaches extensively and internationally to thousands of people each year with humour, kindness and wisdom exemplifying the essence of the Kadampa Buddhist way of life. We are extremely fortunate to have this opportunity to receive teachings from her. What sounds so innocent, light and nice can turn your life into a night mare. Because for most of us ex NKT the NKT is a harmful, very destructive cult and those events are just a means to get and then to burn new members for the expansion of the group at the costs of the individual’s welfare. Gen-la Kelsang Dekyong at Colgate University (USA), April 22nd, 2008. (Details here). Images courtesy from New Kadampa Survivor Actvists. A nice, effective, polite and non-threatening way to present information. Newcomers can be aware of both the image the NKT presents of itself, and the impressions of members who were unhappy and mistreated in the organization. Then potential recruits participating in public events can make an informed decision before deciding to get more involved- only fair really! Really brave. I admire that they did it (though it would not be my taste). But in the UK the NKT got deeply into the most sensitive points of society: Universities, schools, NHS, meditation classes, chaplaincy etc. and it needs actions such as these and more to inform the public that NKT is like Scientology which they wouldn’t allow at such sensitive points. There will be less and less need for survivors, or ‘surfacers’ to hide, or to feel ashamed, or fearful that they will be ‘ostracised’ in their local communities. It will become more and more socially acceptable to criticise spiritual groups, particularly Buddhist ones. I feel that criticism of spiritual and religious groups is utterly necessary within our secular culture, where ‘religion and spirituality’ are completely unregulated. We need these public debates to keep ourselves all safe. Unregulated and tax-free, which amounts to a government subsidy. And who pays the income taxes, VAT, excise duties, etc.? People like us. If NKT centres style themselves as bookstores, with non-religious meditation activities as an adjunct, let them pay taxes on their profits, land transfers and sales. Both in the UK and in the US, the NKT related businesses are classed as ‘charities’ and do not pay any taxes. Individual teachers may have to pay taxes but incoming ‘donations’ can easily be hidden or ‘gifts in kind’ accepted through centres. That is why ‘Geshe Kelsang’ himself could pay $1.75 million for the new Hollywood NKT centre. No taxes, fully dependent on volunteers with no contracts, so anyone who disagrees with anything can be asked to ‘leave’ as they are ‘not happy’. It’s the blood, sweat and tears of hundreds of workers in the UK who renovated the centres for free. Some of these have been sold, others remortgaged and ALL profits from all centres, Tharpa, the festivals, all of them go to the ‘World Peace Temples’ or ‘International development’ fund (have to look up the current title) which buys the real estate. No tax coming in to the major countries involved in supporting the NKT I am afraid. You are under an illusion if you think this is the case. Looking up real estate listings in Sag Harbour, East Hamptons, New York the sale price for the Vajravarahi “bookstore” (as NKT’s lawyer called it to get zoning permission) was $3 million. All in all, tax free slave labour is a capitalist’s dream! There have been successful lawsuits against religious groups which took advantage of unpaid workers to spruce up old or build new properties, to sell at a profit. Successful lawsuits for wages that should have been payed. Just sayin’. Did anyone bother to listen to dekyoing’s talk? Does she always speak like that? I’d almost forgotten the deliberately hypnotic NKT teaching voice but I don’t think any observer could deny that dekyong was deliberately trying to elicit a more suggestible state in the audience. How come they don’t notice and call her on it? I listened and I posted a comment exactly about this but deleted it later again because I found it too negative. “Modern Buddhism” basically means they sold themselves out. As authentic dharma teachings do not accomplish the task of getting people in the door (and numbers of bums on seats in the NKT’s rather worldly measure for success), they present inane feel good platitudes as “Buddhism”. Essentially, they are now selling a product. It is interesting how in this process it is more and more KG’s lightweight chicken soup for the soul books that are taking prominence, while more challenging volumes like “Ocean of Nectar” are slowly fading out. how does Neil’s ‘special’ TTP compare to the original TTP in terms of curriculum? I bet it is dumbed down. Back in 1997, when Kelsang gyatso took to the internet to argue with a small number of western Buddhists, he spelled out his mission. The evangelical nature of his mission is clear and he really does seem to measure his success as purely based on ‘bums on seats’. When you have close students like Neil Elliot, Steve Wass and Steve Booth you can’t really blame him for not measuring success on the progress his students are making on the path. He essentially explained that by going for expansion and growth (spreading the Dharma) he was following Lama Yeshe’s wishes. “Do you know what was Lama Yeshe’s intention in organizing Dharma Centres in the west and inviting Tibetan teachers? It seems that you do not understand this. His intention was to spread Buddhadharma throughout western countries, and with this intention he invited me to come to Manjushri Institute in England. He then requested HH Trijang Rinpoche to ask me to come to England. It really needs to be understood that when we are reading outlandish unpleasant claims from NKT members like Rabten, Phagpa or Khyenrab, all these ideas and views (worst dictator, etc.) came directly from gyatso. His students are just doing what he has told them to do and parroting the arguments they have learned from him. If they don’t answer a particular point that may well be because they haven’t been told what to think about it. I think you need to improve your understanding about Lama Yeshe’s main intention. 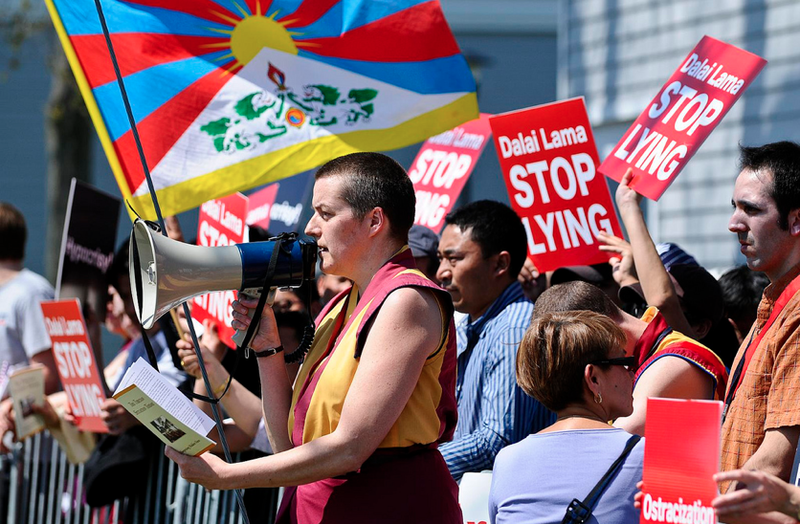 “Lama Zopa’s decisions are none of my business, nor are they any of the Dalai Lama’s business. If you check carefully, your praise of Lama Zopa in the foregoing paragraph is actually denigrating him. My comments about Lama Zopa indicate that in reality he did not choose to break his commitments, but gave up his practice of Dorje Shugden due to pressure from the Dalai Lama. He had no choice. This is what I believe, but now you are saying that he chose to break his commitment himself, so therefore this is worse. He received life empowerment from his root Guru, which he cannot ignore. So you should think carefully, who in reality is criticising Lama Zopa? My intention is not to criticize other Lamas, but what I am saying here is the truth – in reality they all have no choice. I have already said that I never criticise these other Lamas. Instead of this I have great sympathy for them because they have had to stop their daily practice of Dorje Shugden, which is their commitment. They have no choice about this. Day and night I pray how wonderful it would be if these Lamas could have religious freedom. Because we all are disciples of HH Trijang Rinpoche, these Lamas are my vajra brothers, we have the same spiritual father. kelsang really does think he was doing what was best for Lama Yeshe and Lama Zopa; spreading the ‘pure Dharma’ because the FPMT can’t, as they are forced not to by HH Dalai Lama. Thank you, yes, everything makes sense to him in his twisted (and very simple) universe. Most of the people there were already part of the NKT and used to the voice. It’s the voice every NKT teacher uses. That was the most astonishing – going to Tibetan teachings and no ‘hypnosis’!!! But, it’s also a western style. I have heard other non-NKT western teachers do a similar ‘meditation’ voice. Is this a Christian habit? An ‘idea’ about what meditation ‘should be’ or what? I do know that what we did in the NKT comes under hypnosis, after studying a course in hypnosis soon after I left the NKT. As NKT teachers we would often discuss how to ‘bring people in’ and convince them, offering them something more, making them want something more…. There is also quite clever cognitive dissonance going on – where contradictions create a feeling of uncertainty, which is then filled by an affirmation of ‘truth’ – whether the powers that be in the NKT are aware of it or not. And polarities are set up – for instance, ‘pure’ supposes something that is ‘not pure’ -Your mind then sets up a black and white implicit contrast that gets ‘filled’ in unconsciously every time you ‘see’ something. And the them/us mentality is at its ‘highest’ development in the demos against His Holiness. ‘He’ is wrong, ‘we’ are right and pure, etc… and it goes on and on. The voices are all part of this process of indoctrination in the name of ‘peaceful meditation’ and the proposed ‘life of bliss’ that awaits you quite soon if you join the group… very enticing. Hardly any hard work to do mentally, quite unlike Dharma elsewhere. Lazy Dharma or is it Dharma at all? When a motivation is mixed, then what does it become? Not much about ‘future’ lives – it’s all about having a good time now, promoting the tradition’s expansion ‘in the future’. That’s the ‘giving’. Quite oddly clever. Postponing enlightenment (retreat, study, etc – they have no idea how much Tibetan monastics study) to work for the Guru/NKT. Like a kind of ‘instant credit’ that’s promised for the future. But the future will always be the NKT. They assume. I wonder also what the students of the University of London and impartial observers were thinking having experienced her? The video you posted, just to clarify, isn’t of the talk Dekyong gave last week in London but of another a few years ago. To be fair, the tyical Catholic sermon is also held in a strange, wannabe hypnotic tone that is quite distinctive to how the priest is talking in normal life. Anyone can tell me clear and simple, why is Sugden practice wrong? How it harms HH Dalai Lama or Tibetan cause? The most dificult thing for me to understand is: Teachers are sacred or holly for budists, whay HH Dalai Lama Broke with his teachers who practiced Shugden as well… This is like breaking his lineage to Buda, isn it? Please tell me where can I find an answer to this questins. Thank you very much, may all beings be happy! Not only that, Castor, but Ling Rinpoche, the Dalai Lama’s senior tutor, did not worship Shugden. Also, His Holiness never “broke” his bond with his tutor Trijang Rinpoche. He explained his difference of opinion regarding Shugden to Trijang Rinpoche respectfully and he has never criticized any other aspect of Trijang Rinpoche’s teachings. This is how Buddha and Je Tsongkhapa advise us to act if we feel our teachers are acting in ways that are in accord with the Dharma. The Dalai Lama is not breaking with Buddha– he is following Buddha’s advice. Read the 12th Jataka tale– the story of Buddha’s past life. Read Tsongkhapa’s Lamrim Chenmo. “the views of all Sakyas, Kagyus, Nyingmas and so on are erroneous. They are not even Svatantra or Cittamatra, let alone the view of Prasanga Madhyamaka – meditating only the nihilist view like tirthikas and Hashang. If one upholds the nihilist view, the result is nothing other than going to Avichi hell.” He said that dogyal killed Gelugpas that sought teachings from other traditions. Pabongkha’s close student was Trijang Rinpoche. He also taught that dogyal killed Gelugpas that took teachings from other traditions. Trijang Rinpoche was a strong supporter of dogyal as it was his monastery’s main protector. He wasHH Dalai Lama’s junior tutor, but. some of HH Dalai Lama’s other teachers like his first lama Retreng Rinpoche, Ling Rinpoche and others like Khunu Lama Tenzin Gyaltsen did not worship dogyal. HH Dalai Lama has always taught that people should be non-sectarian and value all lineages of the Buddha’s teaching. He took teachings from other traditions and encouraged others to do the same. As the practice of dogyal worship threatened Gelugpas with death if they took teachings from other traditions some of HH Dalai Lama’s teachers were not only encouraging people to disregard HH Dalai Lama’s advice, they were also threatening the life of the Dalai Lama. Ultimately, sectarianism is considered harmful because it entails holding negative views about the Dharma and negative views about the realised teachers that taught these other traditions.